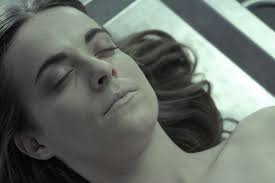 Released on October 8th, 2015 through Invincible Pictures, the unrated Spanish thriller The Corpse of Anna Fritz has the benefit of a certainly intriguing set-up. To its further credit, director Hector Hernandez Vicens, who co-wrote the strictly serviceable screenplay with Isaac P. Creus, paints the seventy-five minute chronicle in a largely subtle, classic genre approach. True to form, there is wonderfully welcome, gradual build-up throughout much of the first act. The tale gets extra mileage from such a decision. It summons the viewers into its web initially with effective degrees of mystery. There also appears to be an ominous tension waiting to strike from beneath its surface. Ricard Canyellas’ dark and brooding cinematography compliments this attribute splendidly. What is just as interesting is the manner in which the composition successfully comments on the way the public views and treats celebrities in its commencing moments. This combination of atmosphere and social commentary, mixed with the taboo of necrophilia which is heavily mixed into the plot, assures us the resulting feature will be bold and fascinating. Alas, these opening bits are the pinnacle of this silver screen travesty. They suggest far more than the movie actually delivers. Once a twist kicks into play at the twenty minute mark, the tale jolts us again. It seemingly ups the ante on the nightmarish situation unfolding. Sadly, the promise Vicens and Creus so delightfully conveys up until this point is quickly unveiled as a scheme. Once the previously stated segment arises, the last fifty-five minutes of the depiction stumbles with a decidedly by the numbers story arc. During this later period, the piece proceeds to constantly run itself around in circles. It’s insistence on keeping the leads in the morgue for much of the duration also becomes quickly grating. Such also limits the opportunities of the account severely. In the end, Vicens and Creus’ cinematic affair has its amusing sections. Still, it’s as if the auteurs used all their invention on pulling us in. Once this was victoriously achieved, the pair decided to fall back on genre conventions and repeated ideas remained ad naseum. It makes the whole an ultimately a tedious exercise. The undertaking is never quite dull. Yet, it is certainly unfulfilling. 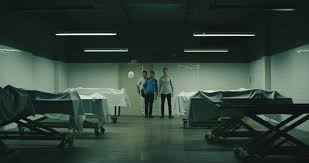 By the time the similarly predictable and underwhelming finale comes into play we find ourselves admiring the restraint of the effort, especially given its off-putting subject matter, more than anything else the filmmakers conjure herein. Vicens and Creus tell the tale of Ivan (Cristian Valencia), Pau (Albert Carbo) and Javi (Bernat Saumell). They are led into a hospital morgue where the title individual, a popular actress, lies sprawled out on a gurney. Soon the three seize the opportunity to indulge their fantasies of being with the deceased. Amid this action, the trio unveil that Anna Fritz (Alba Ribas) may not be as dead as she seems. Among the problems of the script is that Ivan, Pau and Javi are all treated like adult variations of the stereotypically hormone driven teens who are killed off one by one in your garden variety horror offering. This attribute is especially highlighted early on with the three spouting juvenile dialogue galore. Once the actual story arrives and the tone becomes decidedly more serious so do the men. Not only is this much fitting to the fashion of such terror archetypes as mentioned above but, it is almost as if we are supposed to forgive and forget the heinous light the application illuminated them in previously. This could be overlooked if the screenwriters gave them even an ounce of character development or even a reason for us to care for them. Fritz is given much the same treatment. We never get to know anyone on-screen in the least. It makes the experience distant and cold. The run-around motions of the last two acts might not have been so noticeable if we were invested in any of these personages in any manner. To its credit, Ribas is fantastic. This is visible in her ability to convey emotion through wide-eyed facial expressions. Given that her role hinges on the quality of such characteristics, with the writers giving her almost no dialogue, this becomes one of the flick’s few triumphs. Valencia, Carou and Samuell distribute fine enactments with what material they are given. Yet, the ultimately hollow script rarely utilizes such opportunities for the aforementioned individuals to showcase their capabilities in the way it does with Ribas. Ultimately, the on-screen personalities are simply put there because the narrative requires them to be. They are pawns. We see this in the reality that they are given no depth. Nor do Vicens and Creus issue any attempt at them becoming fully realized. Such is a shadow that eclipses the entire exertion. Despite this, Tolo Prats’ sparse, but unnerving, original music serves the venture well. Alberto Bernad’s editing is masterful. It helps the illusion that what we are seeing is actually transpiring before our eyes. Zeroquatre’s art direction is tremendous. The same can be said for the moody lighting. It is also true of the believable visual effects from Javier Peirot. Urko Garai and Miquel Linas deliver top-notch sound department contributions. Pi Piquer’s costume and wardrobe choices add further commonplace authenticity to the project. Cristina Pellicer and Cristina Pellise provide excellent make-up. This is visibly evident in the credibility of Franz’s recently passed appearance in the early instances. Regardless, these solid influences do little to mask the gaping flaws of the fiction itself. The Corpse of Anna Fritz begins promisingly. Despite this, it ultimately falls victim to its own choppy pace. It issues suspense intermittently. Our interest ebbs and flows throughout. Yet, it cannot sustain its nail-biting demeanor long enough to be deemed satisfactory. This is especially baffling given the taut movement suggested by the wisely scant running time. Likewise, there are rarely any genuine surprises in store. Not to mention, the piece ends on a whimper. All these details indicate a disappointment. Vicens and Creus have created a sadly mediocre, forgettable affair. It is one that will have even the least demanding of genre fans waving their hands and shouting, “That was it?”!